Shows the mythical Kingdom of Prester John in Abyssinia. Aethiopia Superior vel Interior vulgo Abissinorum sive Presbiteri Joannis Imperium. A fascinating map of central Africa issued by Willem Janszoon Blaeu in 1635. The map covers from the Bight of Benin to the Indian Ocean and from Arabia and the Red Sea to Mozambique. It includes two decorative cartouches as well as stylized images of African fauna, including elephants, monkeys, and ostriches. While the African coast exhibits considerable advances over earlier maps of the region, the interior of Africa exhibits a cartography primarily based on the literature of antiquity and little changed from the days of Ptolemy. Superimposed on these speculative lands is the legendary Kingdom of Prester John (Presbiteri Ioannis) – a persistent and popular figure in european folklore. The legend of Prester John dates to about 1145 when a Syrian priest name Hugh traveled to europe to canvas for a fifth Crusade. Hugh described Prester John as a great Christian king whose empire was located somewhere in India – the idea being that the two great Christian empires, that of John and that of the Pope, would together make war on the Saracens occupying the Holy Land, thus sandwiching the enemy between their two indomitable armies. About 20 years letter a curious letter began to circulate around europe, purportedly by John himself, wherein the mythical King claimed to be some 562 years old and the ruler of the Three Indias. 'India' at this time referred not just to the subcontinent, but to much of southern Asia. It was divided into three parts, Farther India or what is today India and Southeast Asia, Nearer India or the modern day Middle east, and Middle India or the parts of Africa to the east of the Nile River. Having failed to pinpoint the Kingdom of Prester John in Asia, scholars as early as the 14th century began locating John's Kingdom in east Africa. Here they had a bit luck for explorers in the region, starting with the Francisco Alveres of Portugal in the 1500s, soon came into to contact with the Christian Solomonic Kings of ethiopia or Abyssinia. The Coptic ethiopian emperor David II fit the mold of the 'Prester John,' and Alveres believed him to be a descendent of the legendary John, thus firmly entrenching the mythical kingdom Prester John on maps of east Africa well into the 18th century. Cartographically this map is derived from Blaeu's own 1608 wall map of Africa – one of the most important maps of the continent ever drawn. Most of the interior details offers here are derived from classical texts such as the Geographia of Ptolemy. The map follows the Ptolemaic model with regard to the course of the White Nile and its source in two great lakes – the Zaire Lacus (Zembre Lacus) and the Zaflan Lacus, themselves in the foothills of the Mountains of the Moon or Lunae Montes, located at the base of the map. The Blue Nile, which has its source is modern day ethiopia, is expressed as a complex network of rivers and valleys bearing little resemblance to reality – though the observer will note that many of the place names, Amara, Tigre, Dobas, and Dangali, do in fact reflect real places and are still in use today. 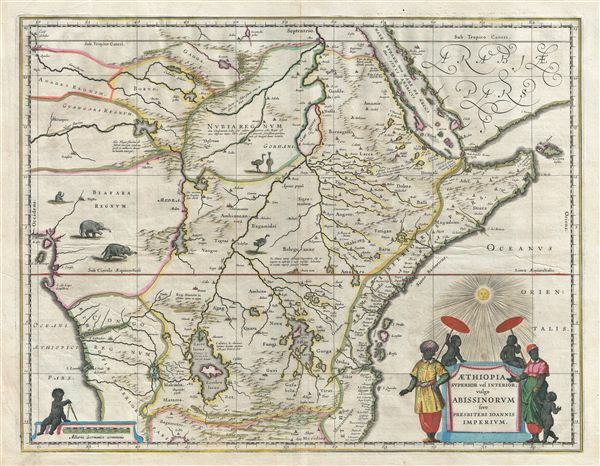 Blaeu also draws a lake at the source of the Niger River, set just north of the West African Kingdom of Biafara, but fails to properly connect the river to its southern extension – which is vaguely noted. An altogether wonderful map of Africa. Published in the Latin edition of Bleau's Atlas Major. Blaeu, W., Atlas Major, (Amsterdam) Latin Edition, 1635. Very good. Mild toning. Original centerfold. Latin text on verso. Old Color. Van der Krogt, P. C. J., Koeman's Atlantes Neerlandici, (3 Vols), 8720:2. Goss, J., Blaeu's The Grand Atlas of the 17th Century World, pp. 152-53.